Looking for used material? Give us a call to see if any of our current inventory fits your needs. Issues such as structural component integrity, seismic load capacities, proper welds and the gauge of the material are frequently overlooked by the infrequent buyer of used equipment. 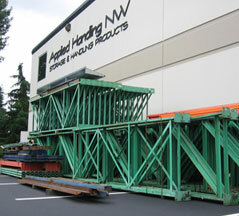 Used material sold by Applied Handling is carefully evaluated prior to being offered for sale. As a result we are then confidently prepared to submit engineering documents in pursuit of permits followed by installation. If you are looking to purchase pre-owned material or sell your used material handling equipment we can help. We will clearly represent the condition and allowable capacity of used material offered for sale. Material is owned by Applied Handling. Inspection of our used material is encouraged. Offers for material are clear and transparent. 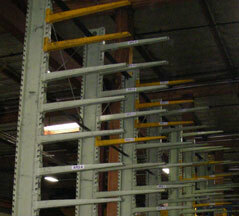 The tear down of your racking, if required, is done by a licensed insured contractor. Selling your material all in one transaction can save time and money. Credit can be applied to new rack purchased from Applied Handling. Used material can be safely installed in most applications. There are times when we have the exact product you are looking for in used. In other instances the buyer may need to be flexible in their design requirements to accommodate the limitations of our current used material. We will always make you aware of any compromises that would be made when purchasing used equipment. Our inventory of used material is constantly changing and subject to stock on hand. Please contact us for pricing and details.